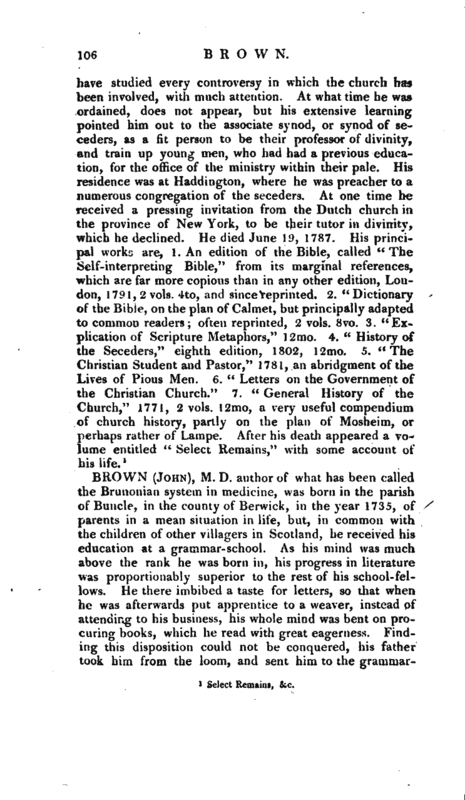 , M. D. author of what has been called the Brunonian system in medicine, was born in the parish of Buncle, in the county of Berwick, in the year 1735, of parents in a mean situation in life, but, in common with the children of other villagers in Scotland, he received his -education at a grammar-school. As his mind was much above the rank he was born in, his progress in literature was proportionably superior to the rest of his school-fellows. He there imbibed a taste for letters, so that when -he was afterwards put apprentice to a weaver, instead of attending to Ms business, his whole mind was bent on procuring books, which he read with great eagerness. Finding this disposition could not be conquered, his father took him from the loom, and sent him to the | grammarschool at Dunse, where, under the tuition of Mr. Cruickshanks, he made such progress that he was soon regarded as a prodigy. He read all the Latin classics with the greatest facility, and was oo mean proficient in the knowledge of the Greek language. “His habits,” we are told, “were sober, he was of a religious turn, and was so strongly attached to the sect of Seceders, or Whigs as tlrey are called in Scotland, in which he had been bred, that he would have thought his salvation hazarded, if he had attended the meetings of the established church. He aspired to be a preacher of a purer religion.” An accident, however, disgusted him with this society, before he was of art age to be chosen a pastor, for which it appears he was intended. Having been prevailed on by some of his schoolfellows to attend divine service at the parish church of Dunse, he was summoned before the session of the seceding congregation to answer for this offence; but his high spirit not brooking to make an apology, to avoid the censures of his brethren, and the ignominy of being expelled their community, he abdicated his principles, and professed himself a member of the established church. As his talents for literature were well known, he was taken, at the age of twenty, to the house of a gentleman in the neighbourhood of Dunse, as tutor to his son. Here he did not long reside, but went the same year, 1755, to Edinburgh, where he applied to the study of divinity, in which he proceeded so far as to deliver, in the public hall, a discourse upon a prescribed portion of scripture, the usual step preliminary to ordination. But here his theological studies appear to have ended, and he suddenly left Edinburgh, returned to Dunse, and officiated as an usher in the school where he had been educated. He now exhibited himself as a free-liver and free-thinker, his discourse and manners being equally licentious and irregular, which accounts for his dereliction of the study of theology. At Dunse he continued about a year. 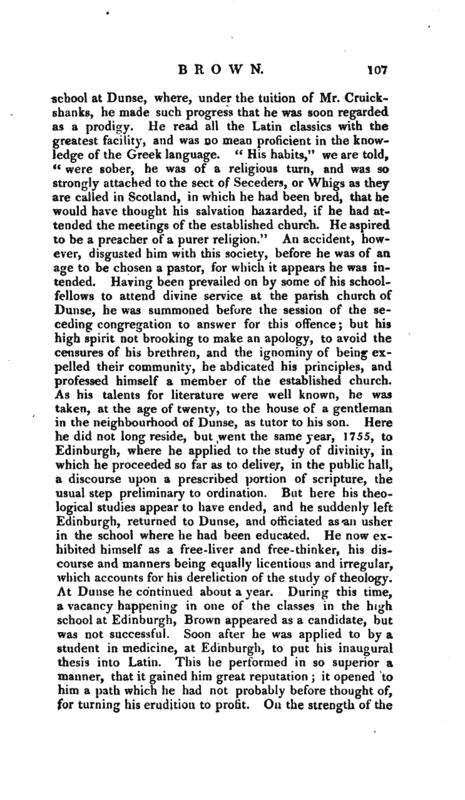 During this time, a vacancy happening in one of the classes in the high school at Edinburgh, Brown appeared as a candidate, but was not successful. Soon after he was applied to by a student in medicine, at Edinburgh, to put his inaugural thesis into, Latin. This he performed in so superior a manner, that it gained him great reputation; it opened to him a path which he had not probably before thought of, for turning his erudition to profit. On the strength of the | character procured him by this performance, he returned to ‘Edinburgh, and determined to apply to the study of medicine. 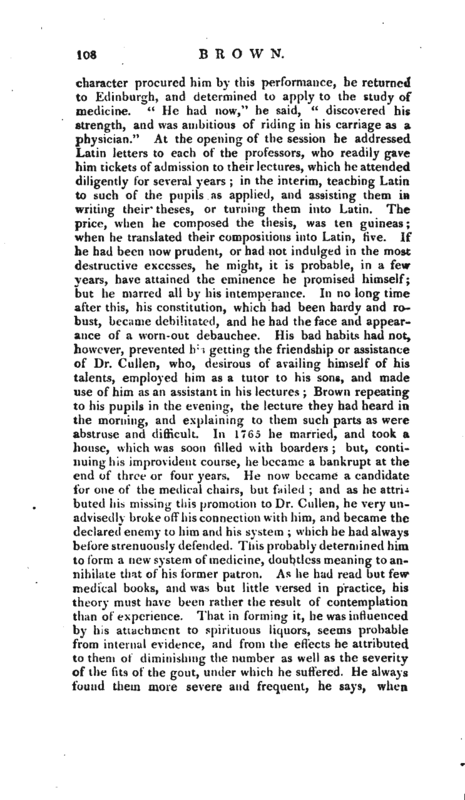 “He had now,” he said, “discovered his strength, and was ambitious of riding in his carriage as a physician.” At the opening of the session he addressed Latin letters to each of the professors, who readily gave him tickets of admission to their lectures, which he attended diligently for several years; in the interim, teaching Latin to such of the pupils as applied, and assisting them in, writing their theses, or turning them into Latin. The price, when he composed the thesis, was ten guineas; when he translated their compositions into Latin, five. If he had been now prudent, or had not indulged in the most destructive excesses, he might, it is probable, in a few years, have attained the eminence he promised himself; but he marred all by his intemperance. In no long time after this, his constitution, which had been hardy and robust, became debilitated, and he had the face and appearance of a worn-out debauchee. 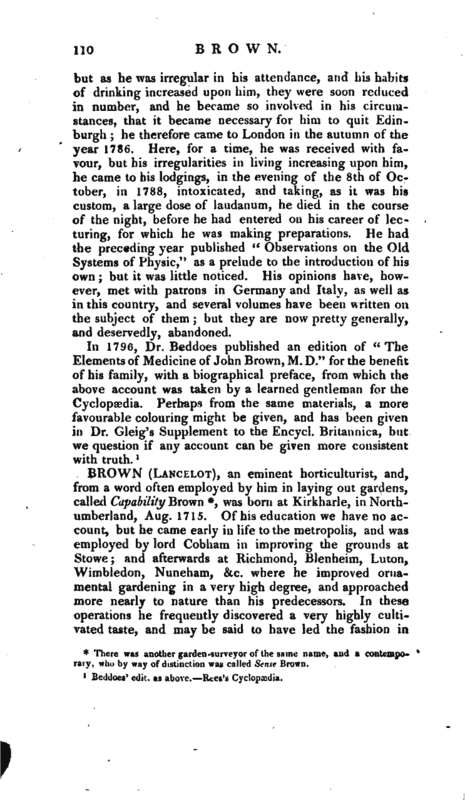 His bad habits had not, however, prevented his getting the friendship or assistance of Dr. Cullen, who, desirous of availing himself of his talents, employed him as a tutor to his sons, and made use of him as an assistant in his lectures; Brown repeating to his pupils in the evening, the lecture they had heard in the morning, and explaining to them such parts as were abstruse and difficult. In 1765 he married, and took a house, which was soon filled with boarders; but, continuing his improvident course, he became a bankrupt at the nd of three or four years. He now became a candidate for one of the medical chairs, but failed; and as he attributed his missing this promotion to Dr. Cullen, he very unadvisedly broke off his connection with him, and became the declared enemy to him and his system; which he had always before strenuously defended. This probably determined him to form a new system of medicine, doubtless meaning to annihilate that of his former patron. As he had read but few medical books, and was but little versed in practice, his theory must have been rather the result of contemplation than of experience. That in forming it, he was influenced by his attachment to spirituous liquors, seems probable from internal evidence, and from the effects he attributed to them of diminishing the number as well as the severity of the fits of the gout, under which he suffered. He always found them more severe and frequent, he says, | he lived abstemiously. One of his pupils informed Br; Beddoes, “that he was used, before he began to read his lecture, to take fifty drops of laudanum in a glass of whisky; repeating the dose four or five times during the lecture. Between the effects of these stimulants, and voluntary exertions, he soon waxed warm, and by degrees his imagination was exalted into phrenzy.” His intention seems to have been to simplify medicine, and to render the knowledge of it easily attainable, without the labour of studying other authors. All general or universal diseases were therefore reduced by him to two great families or classes, the sthenic and the asthenic; the former depending upon excess, the latter upon deficiency of exciting power. The former were to be removed by debilitating, the latter by stimulant medicines, of which the most valuable and powerful are wine, brandy, and opium. As asthenic diseases are more numerous y and occur much more frequently than those from an opposite cause, his opportunities of calling in the aid of these powerful stimuli were proportionately numerous. 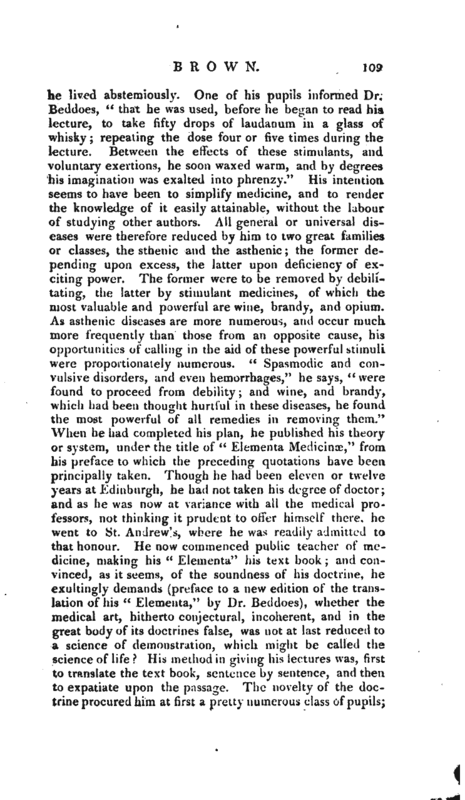 “Spasmodic and convulsive disorders, and even hemorrhages,” he says, “were found to proceed from debility; and wine, and brandy, which had been thought hurtful in these diseases, he found the most powerful of all remedies in removing them.” When he had completed his plan, ’he published his theory or system, under the title of “Elementa Medicinse,” from his preface to which the preceding quotations have been principally taken. Though he had been eleven or twelve years at Edinburgh, he had not taken his degree of doctor; and as he was now at variance with all the medical professors, not thinking it prudent to offer himself there, he went to St. Andrew’s, where he was readily admitted to that honour. He now commenced public teacher of medicine, making his “Elementa” his text book; and convinced, as it seems, of the soundness of his doctrine, he exultingly demands (preface to a new edition of the translation of his “Elementa,” by Dr. Beddoes), whether the medical art, hitherto conjectural, incoherent, and in the great body of its doctrines false, was not at last reduced to a science of demonstration, which might be called the science of life? His method in giving his lectures was, first to translate the text book, sentence by sentence, and then to expatiate upon the passage. The novelty of the docfeine procured him at first a pretty numerous class of pupilsj | but as he was irregular in his attendance, and his habits of drinking increased upon him, they were soon. reduced in number, and he became so involved in his circumstances, that it became necessary for him to quit Edinburgh; he therefore came to London in the autumn of the year 1786. Here, for a time, he was received with favour, but his irregularities in living increasing upon him, he came to his lodgings, in the evening of the 8th of October, in 1788, intoxicated, and taking, as it was his custom, a large dose of laudanum, he died in the course of the night, before he had entered on his career of lecturing, for which he was making preparations. He had the preceding year published “Observations on the Old Systems of Physic,” as a prelude to the introduction of his own; but it was little noticed. His opinions have, however, ' met with patrons in Germany and Italy, as well as in this country, and several volumes have been Written on the subject of them; but they are now pretty generally, and deservedly, abandoned. Beldoes’ edit. as above.—Rees’s Cyclopædia.